Within a five minute walk from the Old City of Jerusalem there is a green and blooming English style garden, which serves as a retreat from the noise and commotion opposite the Nablus Gate. 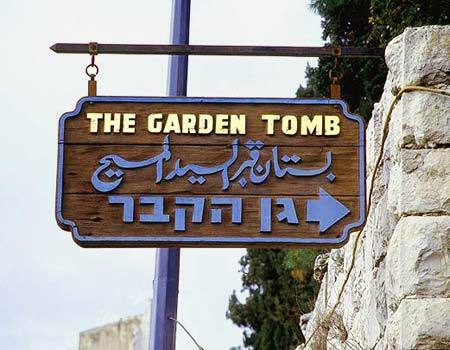 Welcome to the Garden of Eden - the Garden Tomb. According to the New Testament, Jesus was Crucified and buried on Skull Hill affiliated by most with the Church of the Holy Sepulcher in the Christian quarter. But doubts as to the exact whereabouts of Christ's crucifixion and burial place have brought many people in both the past and present to seek the exact location in Jerusalem. Most explorers were British. Some 120 years ago a British General, Charles George Gordon, a hero of the Crimean War who abolished slavery in Africa, came to Ein Karem near Jerusalem. We shall dedicate an entire chapter to his exploits in Jerusalem and in Ein Karem, where he lived for a year, however his most important exploit was locating Christ's burial place. During one of his tours near the Old City, and in parallel to a mystic experience he underwent, he suddenly noticed a small hill close to the Nablus Gate. He envisioned a mouth and eyes somewhat reminiscent of a skull looking at him from the building. He determined that this was Christ's true burial spot. Gordon's "revelation" which was based on the fact that the fenced in area, according to Jewish burial laws, must be outside the walls of the city (he didn't know that the location of the Holy Sepulcher in the Christian quarter, which is in the Old City today, was apparently outside of Jerusalem's borders during the time of Christ). In the New Testament it is written: "After all this, Joseph of Arimathea (he was a disciple of Jesus, but secretly, because he was intimidated by the Jews) petitioned Pilate to take the body of Jesus. Pilate gave permission. So Joseph came and took the body. 39-42 - Nicodemus, who had first come to Jesus at night, came now in broad daylight carrying a mixture of myrrh and aloes, about seventy-five pounds. They took Jesus' body and, following the Jewish burial custom, wrapped it in linen with the spices. There was a garden near the place he was crucified, and in the garden a new tomb in which no one had yet been placed. So, because it was Sabbath preparation for the Jews and the tomb was convenient, they placed Jesus in it." Gordon's finding was supported by Protestants which finally made it possible for them to be granted a holy and important site. The Protestants hardly have any rights to holy and authentic sites in the city. In 1894, the Protestants purchased the land and it was officially named Gordon's Calvary. And this should not be confused with the Calvary hillock at the Holy Sepulcher. Today, it is a typical cultivated English garden run by The Committee of the Garden Tomb located in London, and all visitors can enjoy a free guided tour given by friendly English speaking pensioners. In the South eastern corner of the garden is the small hillock where Gordon identified the skull, and on which a Muslim cemetery is now built. Beneath it is an Arab bus station which was formerly used as a quarry for the building of Jerusalem. In between the garden's trees and flowers, there is shaft that leads to one of the largest water reservoirs in Israel; it is capable of holding some one millions liters of water. Besides the reservoir, there's also a wine press for making wine. A little further on, there is a burial cave with two rooms, which was donated according to the New Testament by Joseph of Arimathea for burying Christ before the Shabbat. Crosses were drawn on the eastern wall in the northern part of the garden, apparently during the Byzantine period when this burial method was used by monks. Today, according to scholars and archaeologists, the burial cave dates back to the First Temple, namely hundreds of years before the birth of Christ. According to estimates, the cave only constitutes part of the complex of burial caves dating back to the First Temple built outside of the walls and primarily located in the Saint Stephanos courtyard nearby. However, local guides insist that the site serves as inspiration dating back to the first century before Christ. At the end of the tour, try and join a group of pilgrims who tend to end their tour close to the burial cave singing psalms - lending the place a foreign ambience. The site has clean public conveniences and a small souvenir shop. The site is open Mondays through Saturdays from 2:30 pm to 5:00 pm. Group bookings should be made in advance at telephone: 02 6272745. The site is located on Conrad Shik Street, a five minute walk northwards from the Nablus Gate. See all talkbacks "The Garden Tomb – Secret of the missing tomb"